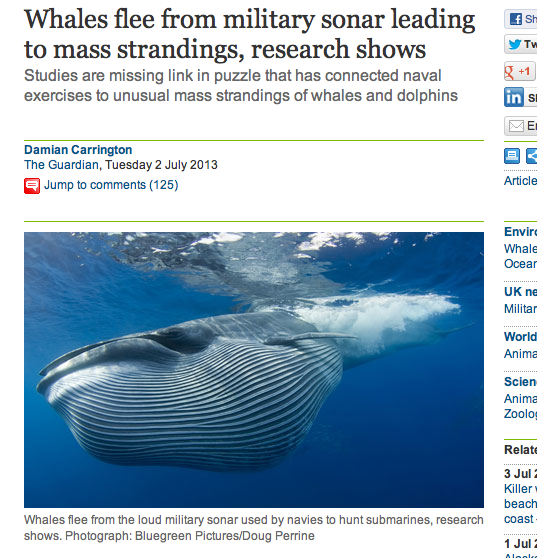 "Whales Flee from Military Sonar Leading to Mass Strandings, Research Shows." By Damian Carrington, for The Guardian. You know that mystifying phenomenon of whales stranding themselves? It's actually not so mystifying. shown to be highly sensitive to sonar. But the research also revealed unexpectedly that blue whales, the largest animals on Earth and whose population has plummeted by 95% in the last century, also abandoned feeding and swam rapidly away from sonar noise. The strong response observed in the beaked whales occurred at noise levels well below those allowed for US navy exercises. 'This result has to be taken into consideration by regulators and those planning naval exercises,' said Stacy DeRuiter, at the University of St Andrews in Scotland, who led one of the teams." 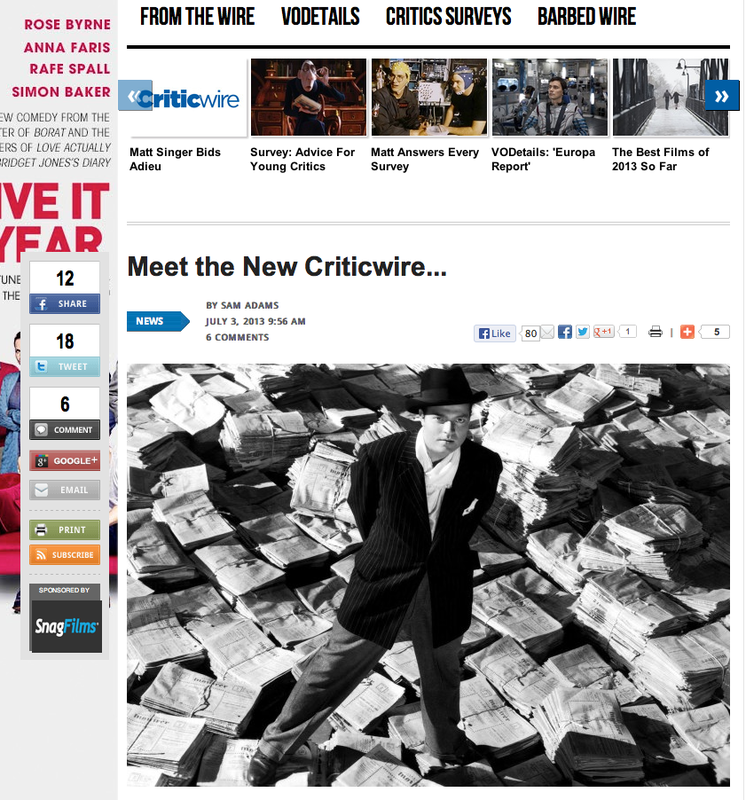 "Farewell my CriticWire." Matt Singer is out at IndieWire's blog/wire service/poll hub CriticWire, and heading over to The Dissolve, the new site created by AV Club expats. Taking over for him? Sam Adams, Philadelphia City Paper film critic, frequent AV Club and IndieWire contributor, and film-and-TV-crit utility infielder extraordinaire. If you read criticism, you've come across his byline. "It's certainly been an interesting time to have this job; it's hard to imagine a more eventful year in the world of film criticism. Not all of the news has been good; critics have received threats -- and even death threats -- with alarming frequency. We've had more than our share of layoffs, an all-too-common story in this day and age. In April, we lost Roger Ebert, one of the greatest critics who ever lived. We'll be struggling to fill the void he left behind for years. Replacing Roger Ebert is an impossible task. But when people say he was the last great critic, or they bemoan the lack of quality criticism on the Internet, or they complain that things used to be better in the good old days, I bristle. Because it's simply not true. Like a great man once said: the good old days weren't always good, and tomorrow ain't as bad as it seems." "Was the Man Behind the Lone Ranger's Mask a Black Man?" Sergio of Shadow and Act says yes, kemo sabe. "Was The Lone Ranger actually based on the exploits of a real life black hero? 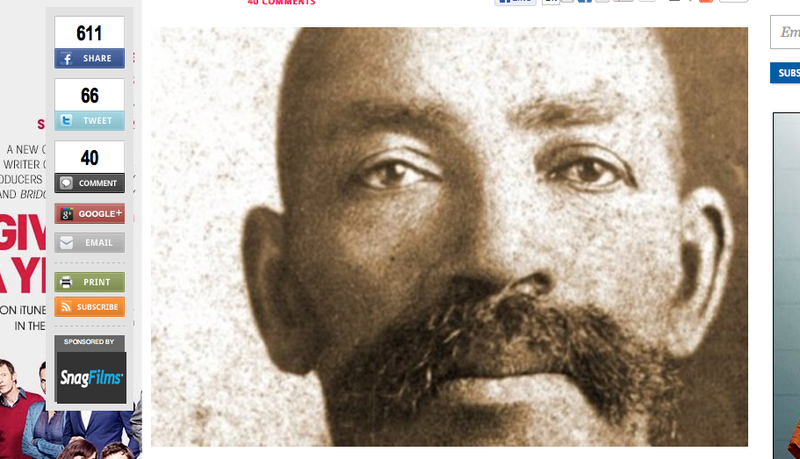 The evidence points to a resounding yes.That person was Bass Reeves (the gent pictured above, with one helluva mustache) who [...] was the subject of a long overdue book written a few years years ago by Art Burton titled Black Gun, Silver Star: The Life and Legend of Frontier Marshal Bass Reeves. Naturally born a slave in 1838, Reeves’ master brought him along as his personal servant when he went off to fight with the Confederate Army during the Civil War. And seeing an opportunity when it presented itself, Reeves escaped for freedom after reportedly beating up his master following an argument over a card game." "Cannes 2013 | A Touch of Sin (Jia Zhangke, China)." By Robert Koehler, for CinemaScope. "[Director] Jia Zhangke is not an artist who normally trucks in anger. In an era when film criticism and programming have been steadily shifting away from a focus on nationalist tendencies, led by filmmakers who’ve become globalized along with the rest of us, Jia has maintained a steady bead on his native Mainland China (which was why the Thailand segment in his 2006 documentary Dong came as a kind of shock). Throughout his astonishing growth into one of the greatest living directors, his attitude has remained one of reflection mixed with despair, immediately expressed in Xiao Wu (1997) and Platform (2000) as, first, an in-between doc/drama on social deprivation, alienation, and crime, and second, as epic autobiographical road movie. Never once with Jia—unlike perhaps some of his other Sixth Generation peers and colleagues—has the viewer had the sense that his aversion to expressions of all-out anger stemmed from fear of censorship. His sheer command of the medium and the methods he’s chosen, the overwhelming and undeniable sense of a freely orchestrated cinema erasing the perception of outside pressures (recalling such artists in censorious climates as Elem Klimov during Brezhnev’s Soviet Union and Sohrab Shaheed Saless during the Shah’s Iran), has never prompted the question: When is Jia going to tell us what he really thinks?" "Sweet November." 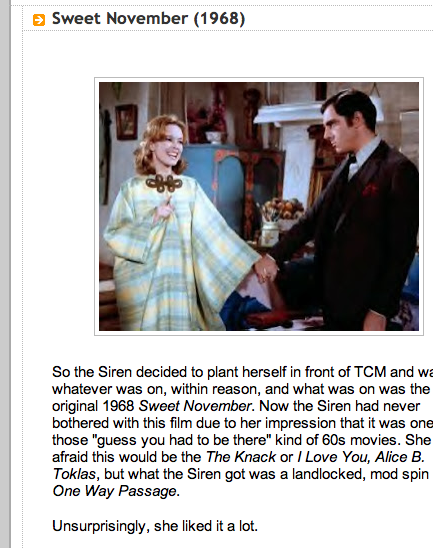 Self-Styled Siren reviews a mostly forgotten 1968 film starring Sandy Dennis as a Brooklyn Heights woman who takes in men for one month only; Anthony Newley is her Mister November. "Sandy Dennis, she of the one-word-forward, two-words-back vocal delivery, makes Sara's impulsiveness authentic, her implausible decisions plausible. Newley belongs to a class of actor the Siren groups under 'the Pizzazz People': performers like Mickey Rooney or Sammy Davis Jr., who have so much show-biz in them that the heart is not on the sleeve, it's planted in the middle of the forehead like a third eye. Somehow putting the pizzazz-y Newley next to the fluttery Dennis results in chemistry—the Siren truly believed this terminal girl and her box manufacturer were having a good time when the camera cut away from her bed." Grant McKee, 21. 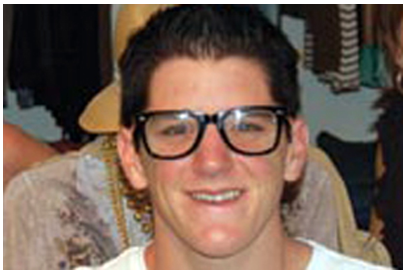 One of nineteen deceased members of the Granite Mountain Hotshots, an elite firefighting unit that previously numbered twenty. The unit was devastated Sunday fighting a fire outside the gold-mining village of Yarnell, Arizona. To view The New York Times' multimedia tribute, click here. The original opening credits to TV's The Lone Ranger, with "The William Tell Overture" as theme.